A Federal truck sat parked in the street in front of the building, the shape obscured by its electric camouflage and the deepening darkness. The Feds must have captured Eadie by now. They would bring her out any minute. Lawrence had no weapon. Gene-spliced Federal Angels were three times his size, and there might be two or three of them with her. He would attack them anyway. That was just how it was with Eadie. Lightning flashed and thunder shook the ground. His brain felt so tiny and insignificant with the EI shut down. For the first time in his life, Lawrence was completely cut off from everything and everyone, but he had brought those Feds to Eadie and he had to find a way to help her, even by himself, with his own minuscule, disconnected brain. A woman emerged from the building, heading straight for Lawrence. He ducked back around the corner, pressing himself flat against the wall. She came around to stand in front of him. Her frizzy brown hair spilled over a bright blue patch on the shoulder of her beige overcoat. Her pale face was wrinkled and haggard but her jaw was set and her eyes were steely. “You’re that student who was with the General!” she said. Brian pressed his back against the wall and slowly swung his head to the left, facing the way he had come, squinting and opening his eyes, trying to make out his surroundings. Only a dim silhouette of another half-crumbled building stood out from the darkened sky. He turned back to the right, peering ahead in the same way, but there was nothing visible at all. It was not his own internal voice, not even the strange new voice that sometimes shouted from inside his head. This voice had definitely been spoken. Brian had felt the breath on his left ear. 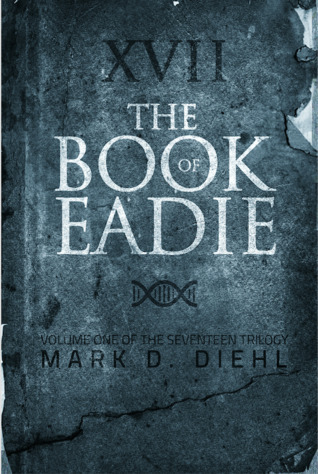 Thanks so much for featuring "The Book of Eadie!" today on Mythical Books! You have a great blog here!